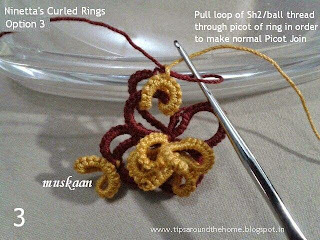 A simple coaxing will make the large ring turn into figure ‘8’. 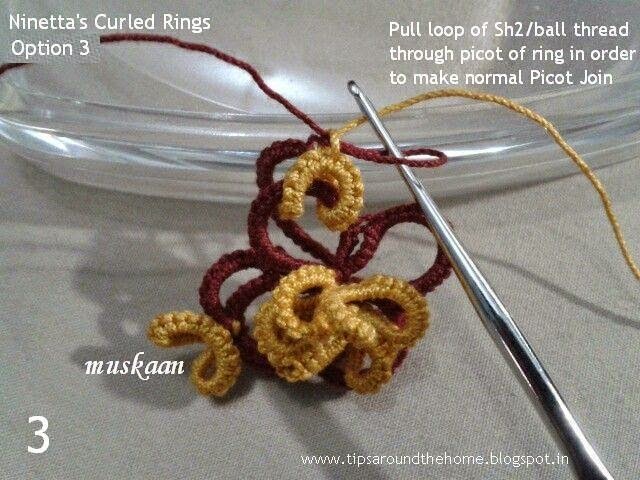 ‘Normal’ curl leads to an asymmetrical cup with great potential for 3D applications. Think of a bead within ! 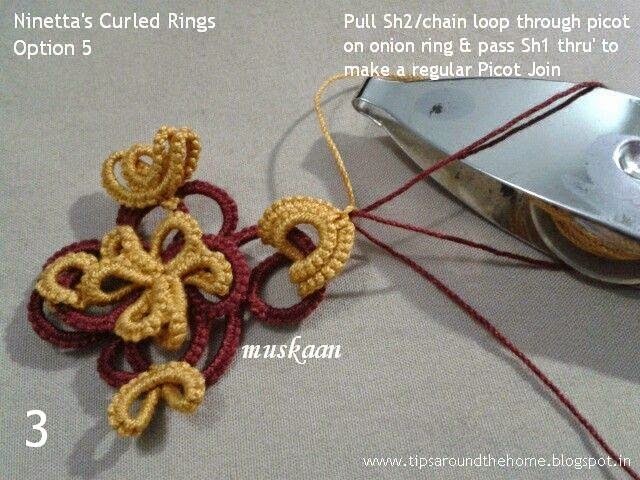 Or if picots are added, then these can be joined later to other elements. Or coax the ring into an '8' & curl. Interesting effects ! 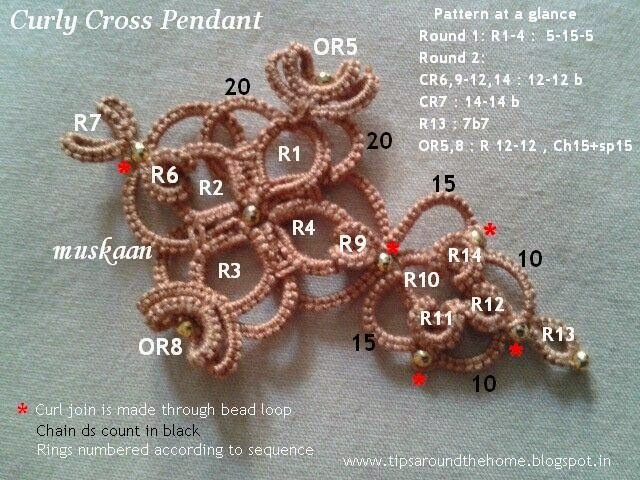 This is how I added a bead at the base of rings in the Curly Cross Pendant :(all beads shown with an asterisk in the notated pic in post). 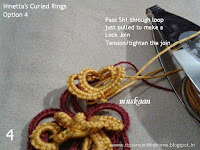 The Curl & Bead are made at the same time, with a single join. Please note : There may most certainly be better methods suited for this. I hope to improve as I learn more. This method is something I figured was working fine (I had the bead exactly in the spot I wanted) without causing me to loose focus hunting around. & brought into position when the ring is closed. Curling is done, as usual, later. 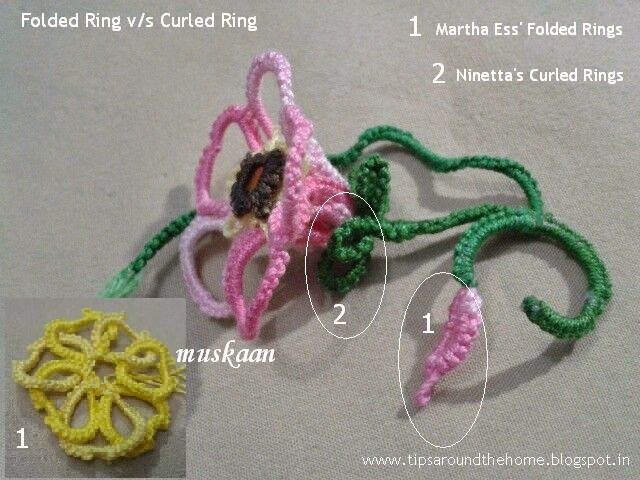 Ninetta has used these in her bookmark tail, here. She recommends leaving a length of thread space to continue between the SR & CR. in order to get a toggle here. 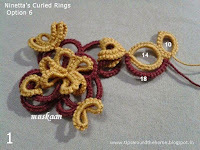 VII Inverted Tatting Curled !!! Simply experimenting with the curled look. Makes for a gossamer petal ! 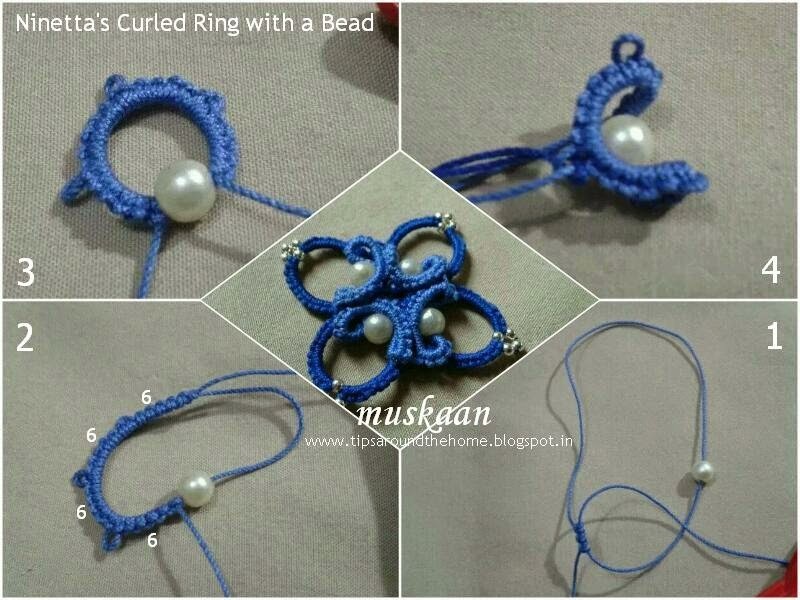 As with so many techniques, some factors are universal, to bring out their real effect & aesthetics .. .
Thread Colour : Lighter shades if using a single colour . Variegated ? Thread Size : Finer threads – upto size 20. Joins : Choice would depend on colour(s) used, how the rings are to be curled, etc. Eg. 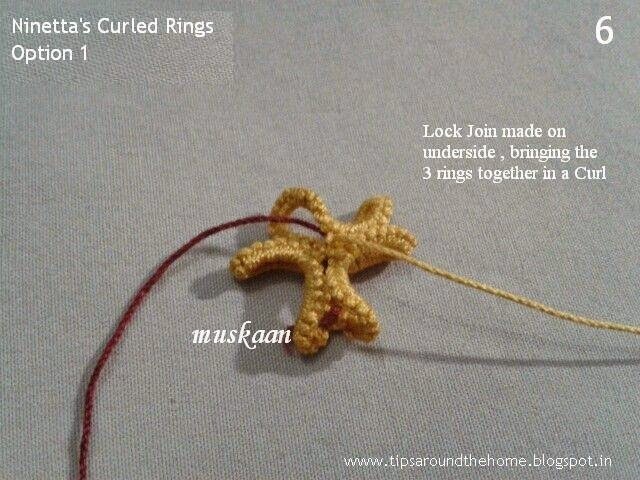 Lock join is preferable for free-standing multiple curled rings, since it provides greater stability. Adjacent CRs can be joined to each other like normal rings, as well as to other elements through the inclusion of picots . eg. the Jewelry Medallion, etc. 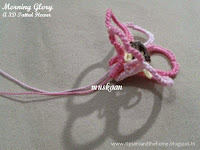 Picot Length : Small picot preferable. 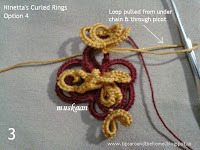 I experimented with longer picots, but it did not work out. However, I still believe, if done correctly, it should work. Experimentation for the future. 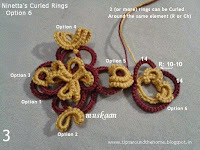 Rings : Split Rings, Josephine Rings, small rings (less than about 20ds) will be difficult to curl, if at all. Sides : There is a distinct front & back side in curling. For Curl Over rings, it does not matter much & convenience is paramount. However, in Curl Around , etc. care should be taken ; here, the curl should be from back to front, such that the picot is lying above the base. 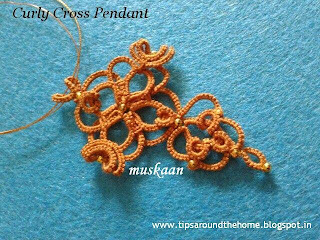 The difference is clearly visible in the mistake (shown within ring) I made in the golden Curly Cross Pendant . Notation for Ninetta's Curled Rings :In response to a thread in Craftree, Judith Connors points out that these curled rings are “more of an effect than a technique”. 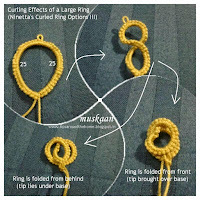 Hence notation/direction can be added after the ring count, with an explanation for the type of curling used either there, or in the glossary. 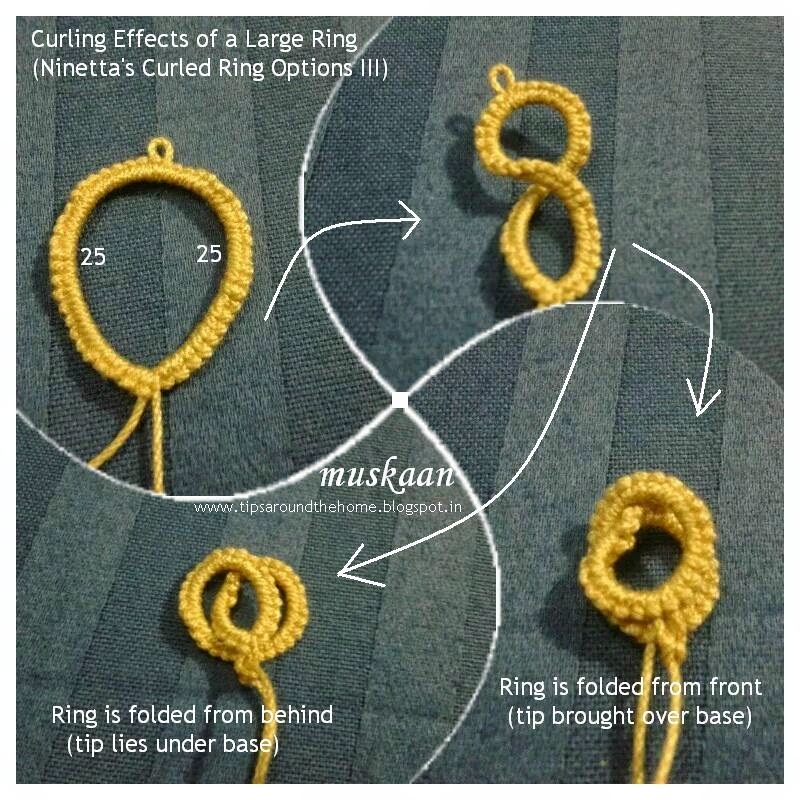 For a great tutorial on how to make a Curled Ring from the master designer herself, check out the Curled Rings Pendant lissted in the Patterns page on Ninetta's blog. A very simple, beginner's pattern. 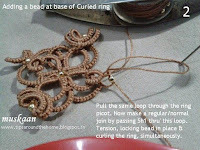 I am, myself, just starting out with beads & have probably used some very basic methods. 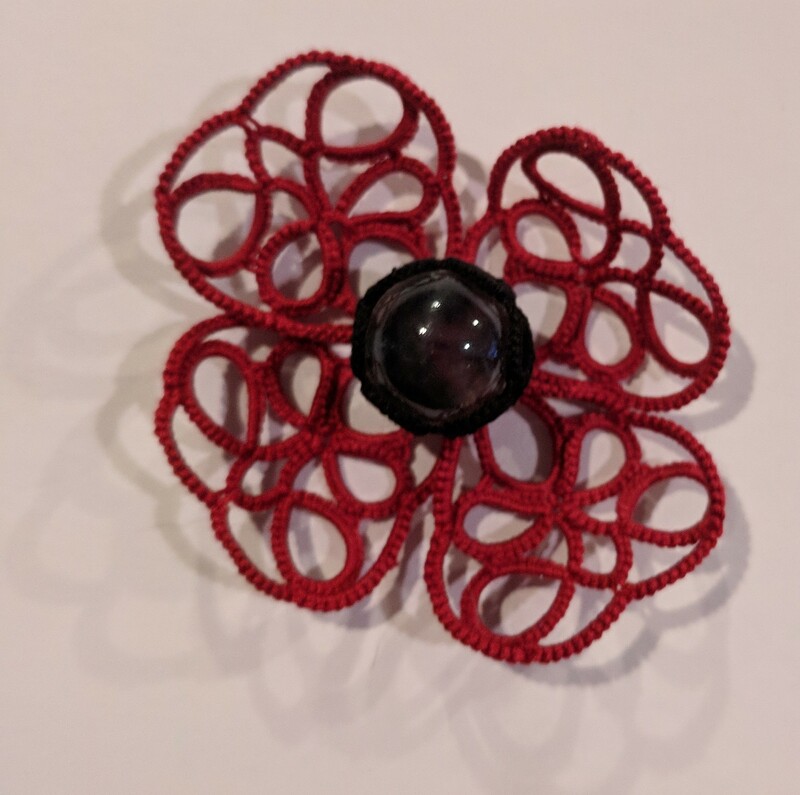 Although yet to try any of her gorgeous patterns, I am certain this medallion (especially the placement of 4 silver beads) was inspired by some of Corina Meyfeldt's pieces. O, the layers hidden in a curl !!! 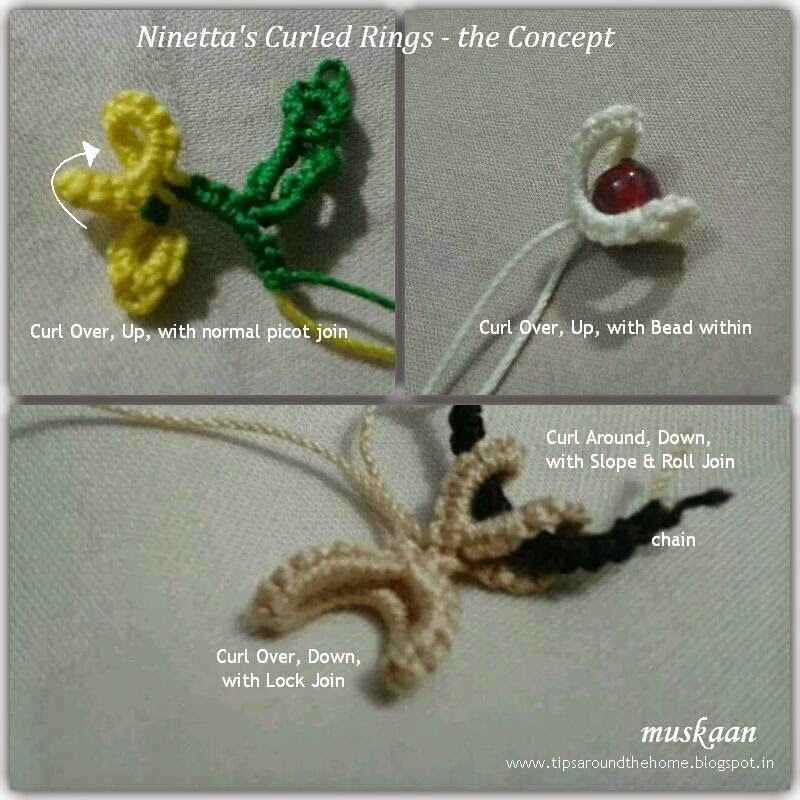 Who would've thought that a simple experiment to showcase the various styles/effects/options of Ninetta's Curled Rings, here would lead to a pattern as well as a serious learning of some basic bead-adding methods ?! As you scroll down, you will see for yourself how the pattern emerged from randomness. 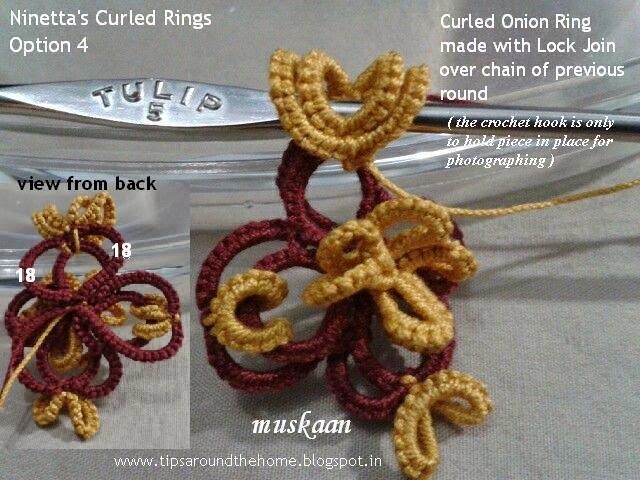 & especially since an onion ring is 'heavier'/bulkier & here it is 'free-standing'. 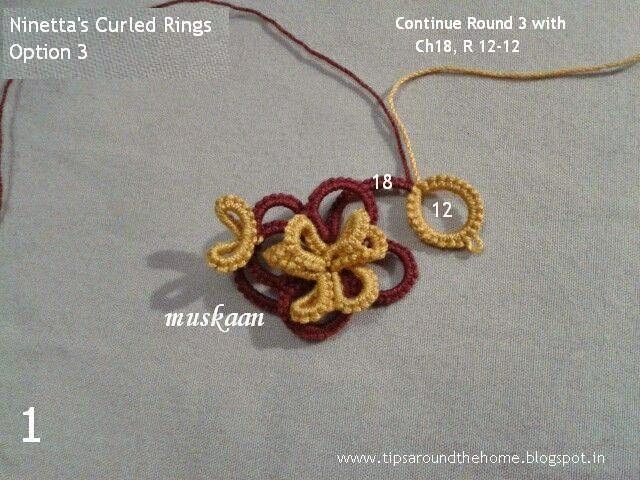 Ninetta has made exquisite use of this option in her edging with curled rings here. In fact, the onion rings in her clover fold upon themselves, with no chain or ring in between. Ninetta has used this along the entire outer edge in her bookmark pattern here. 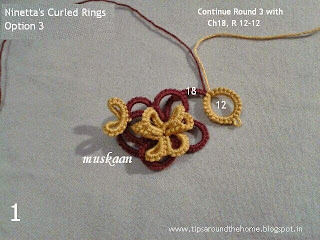 Also used in my pendant in round 2 - the 2nd ring, in the middle of 2 large rings. 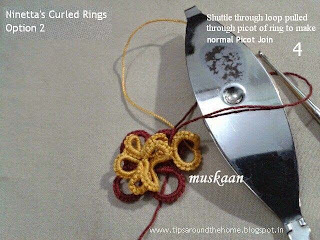 2 Curled Rings around a single larger ring. 6 Options depicted so far. And does it not look like a cross ?! 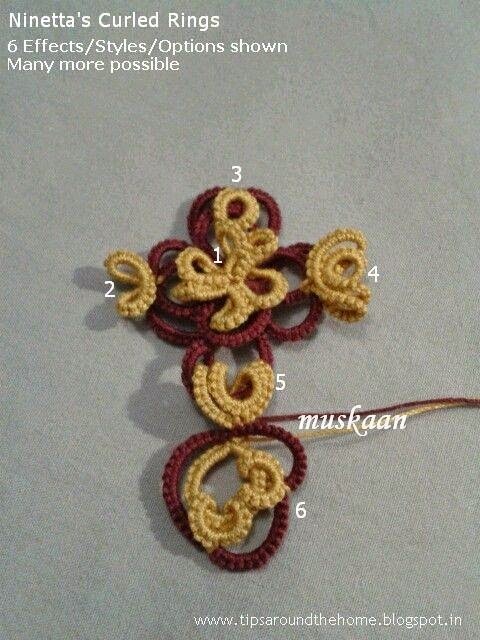 I will share the written pattern in pdf soon. Till then, here's the notation in the pic below. I hope you like the cross pendant. 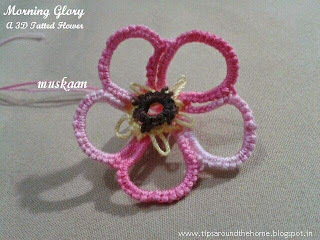 This one, worked in AMC size 40, measures 2½” x 1” . 2 beads are loaded in Shuttle 1, 1 bead in Shuttle 2, & 6 loose beads. 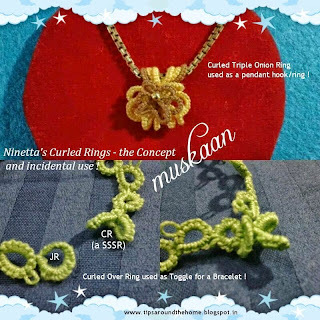 Finally starting with the pictorials on some of the options/variations on how to make the Curled Rings pioneered by Ninetta, and the resultant effects. For the most part, the pictures, & notations therein, will do the talking . And for quick referencing the terms used, I am copy-pasting a part of the previous post on concepts here. 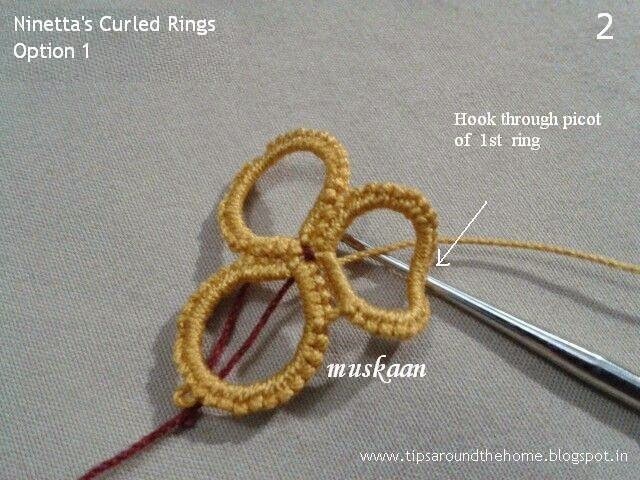 It relates to the minor differences in making the curl, joining the curl, the final look of the curl, etc. 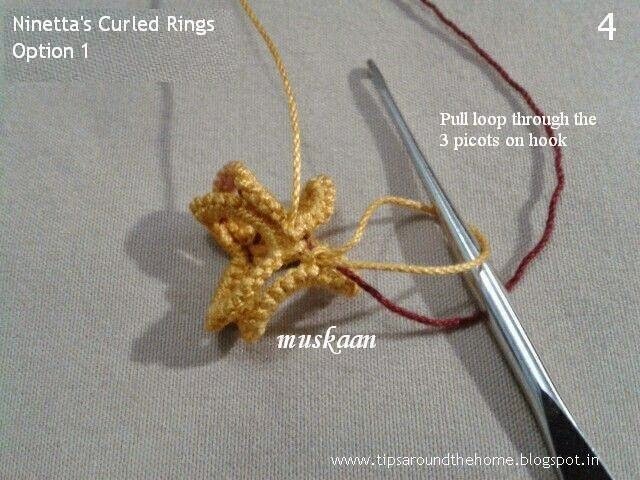 Curl Up / Curl Down : Is the tip of the ring (picot) brought up to lie over the base when curling ; or is the tip folded in downward direction so that the base lies on top of the picot when joining ? 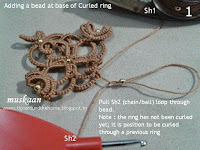 Curl Over / Curl Around : Does the ring curl over itself or does it curl around a chain or ring, thus encapsulating that element? 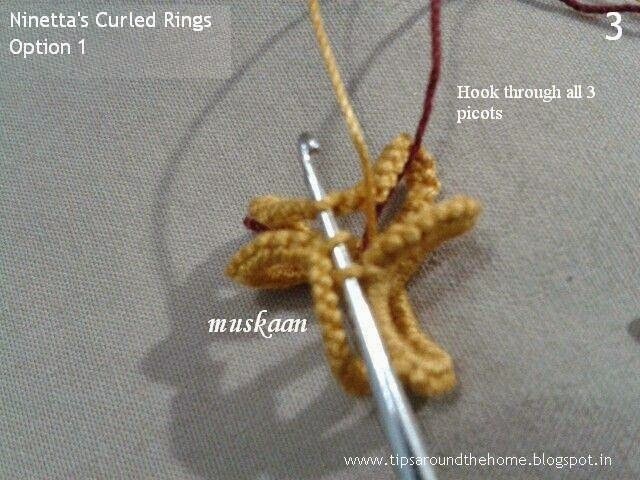 Curl In / Curl Out : Does the curl face inwards or outwards ? 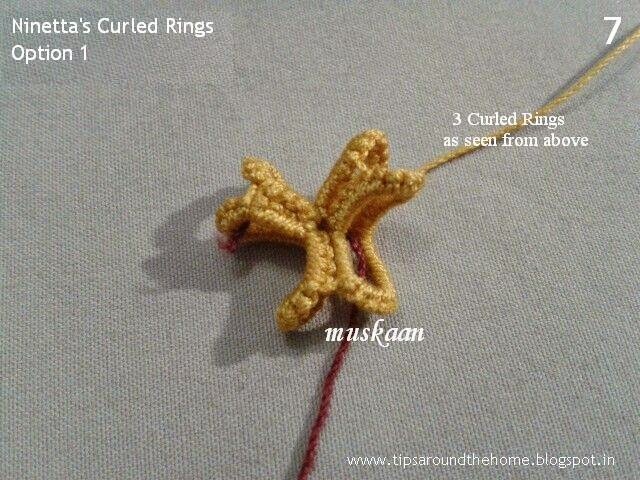 Usually, a Curl In encapsulates an element. 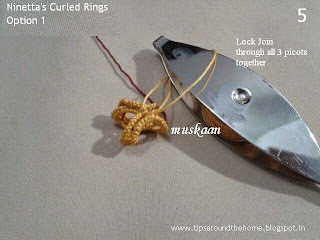 Join : Curl can be anchored using a Normal Picot Join, Slope & Roll Join, or a Lock Join. Curl can be Single or Multiple – in the sense that the curl/join is made through a single picot (normal ring, onion ring, split ring) or the join is made through several rings simultaneously. ♤ The initial options have more detailed steps, which will peter out going forward to avoid repetition. ♤ There is no particular sequence that is being followed. Just trying to cover as many bases as possible in some cogent fashion. ♤ 2 colours have been used for clear distinction & demarcation of elements, joins, etc. 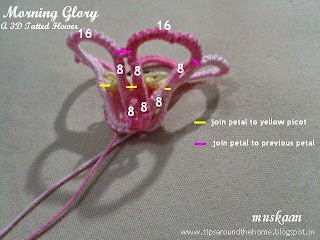 ♤ Stitch counts are indicated for each element/round, for practice purposes. Images 3 to 6 are views from the back, to show the join at work. TIP : A Lock Join is preferable in this case, as it will secure the multiple rings firmly in place. 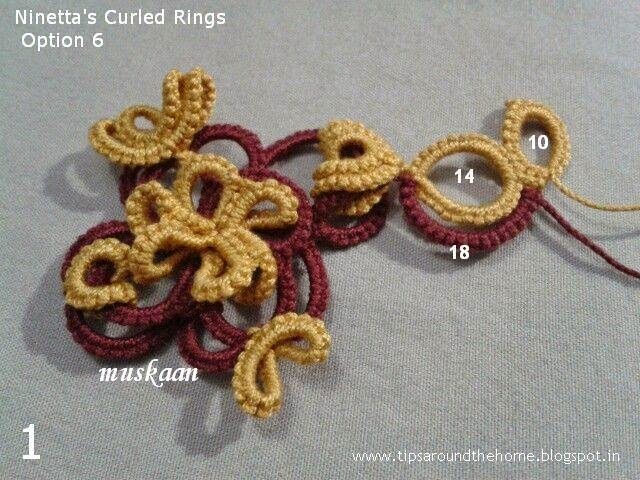 Image 7 shows the curled rings from front. 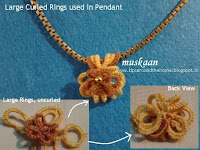 I used Option 1 for the brown center of the Pendant here, except that the 3 rings were not joined to each other. TIP : A Slope & Roll Join could also work in 2 coloured tatting, to avoid colour blips ! 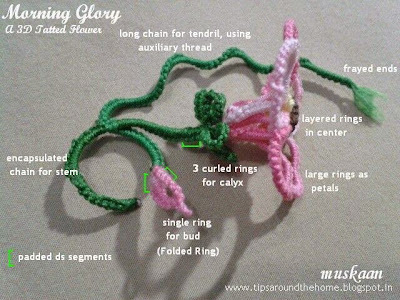 I used Option 2 for the calyx in the Morning Glory flower, here. Ninetta has photographed this option in her earring pattern here. This style is demonstrated by Karen Cabrera in Lesson 145 here. 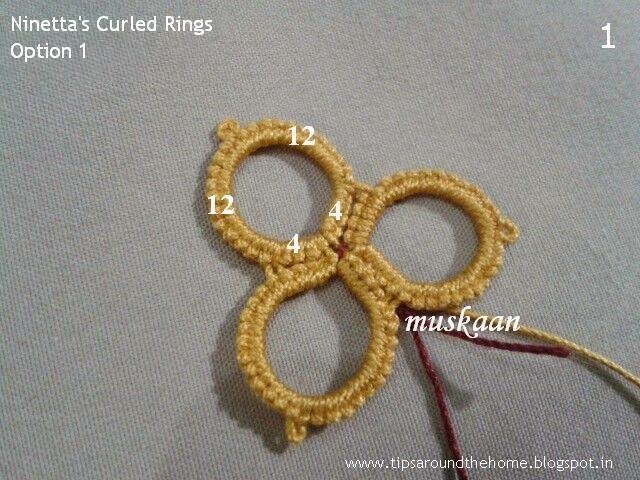 She calls them Folded Rings. Did you notice or have an Eureka moment for this last Option ? It's really that simple and brilliant . 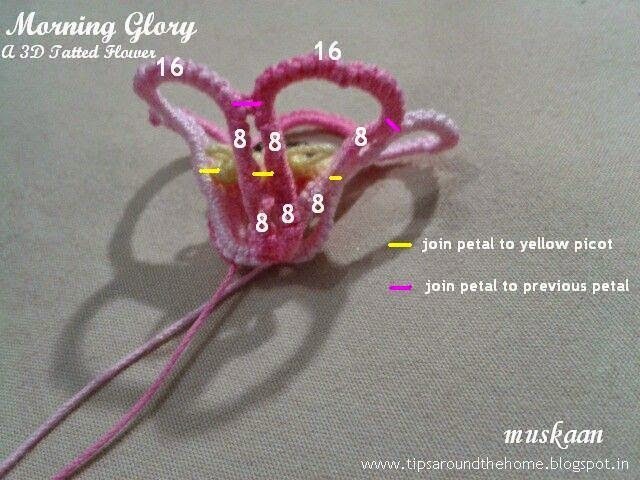 So while designing, if you forget to put a picot in previous row, but feel the need to join while working the subsequent row, you now know what to do ! ‘Ring’ing in the new ! You’ve heard me talking (ad nauseum?!) 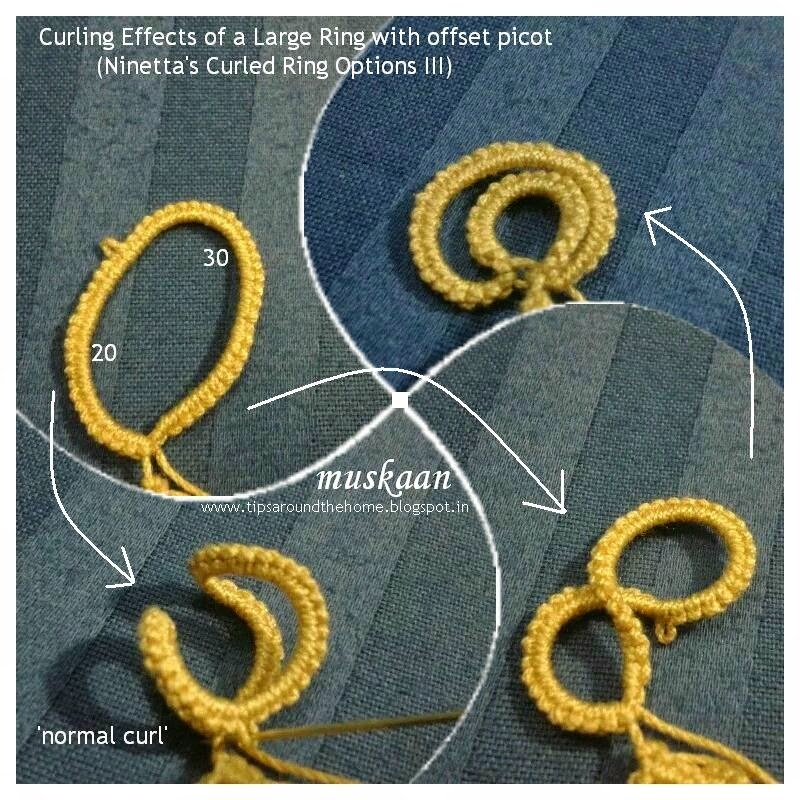 about, & applying Ninetta’s Curled Rings these past few weeks. 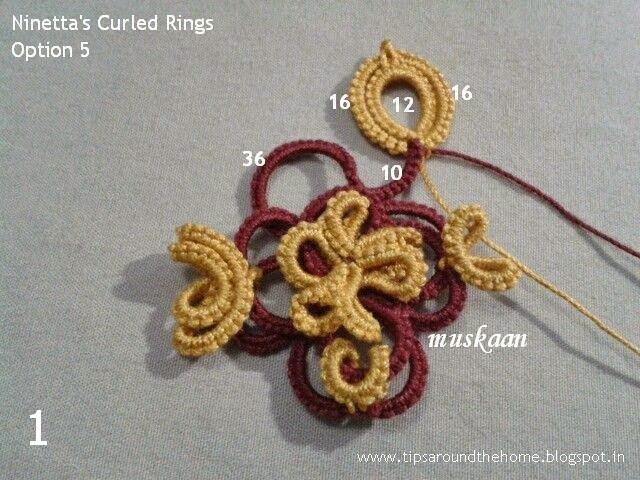 She graciously granted permission to do a tutorial on these rings. And that is how it would’ve been – a pictorial series of options on how the curled rings could be made, used, applied ; the possibilities, the potential. But options kept growing (including valuable suggestions & tips from the designer herself) & my brain went into a swirl with so much …. Now, after stepping back for a few weeks, & a few posts later, I came back to this. Something had changed, though. Something had evolved. 'Behind the scenes' ! If I had the perseverance, I would approach the pictorial that will follow a bit differently. But I don’t have the inclination to start afresh & re-photograph each step (My apologies. You are welcome to ask questions, & contribute suggestions, though). Now, as far as I know (& I don't know much about history, diversity, evolution of tatting, so jump in to correct ), Ninetta's Curled Ring is a completely New & Original technique . Hence, a bit of conceptualization, an overview seemed in order, instead of simply jumping into a how-to pictorial . The following is my own perspective/understanding, based on my limited experience & experimentation with this … I have tried to add some collated images & relevant links to images/patterns wherever possible. 1. What is a Curled Ring ? It is a normal closed ring, folded over itself, which may or may not encapsulate another element such as a chain or a ring. This horizontal folding over creates a cup-shaped dimensional effect, due to half the ring ‘disappearing’ behind. Any ring can be curled, so long as there is a picot towards the tip, to anchor the fold neatly. The ring is made normally ; closed normally. 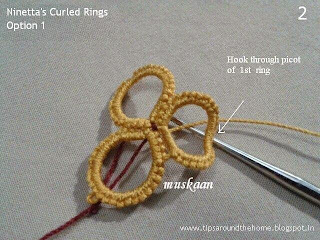 Then it is folded horizontally & a join is made through the picot, at the base of the closed ring. Voila ! 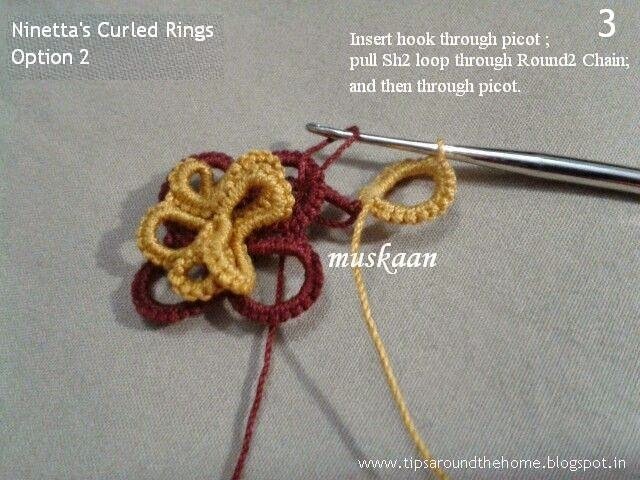 A curled ring is formed. And the thread is back in position to where the ring had been started , ie. 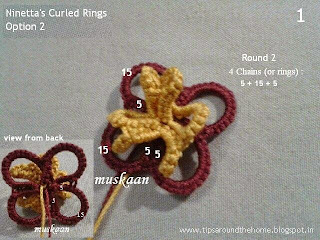 at the base of the ring ; and pattern can continue as desired. 2. Can all Rings be Curled ? 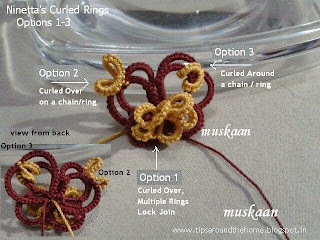 Any, & I stress, Any ring can be curled . And the ring is made “normally”, & the curling is effected only after closing the ring. All it needs is (1) a very small picot in the right place (ideally at the very tip) which will anchor the fold/curl ; and (2) a ring large enough to make the curling possible & visible. Beads can be added too ! 3. What about Folded Rings ? 4. Can there be Differences in the Curl ? Yes, minor differences can exist , although basic concept remains same . The differences can be due to personal preferences, or requirements of a pattern. eg. 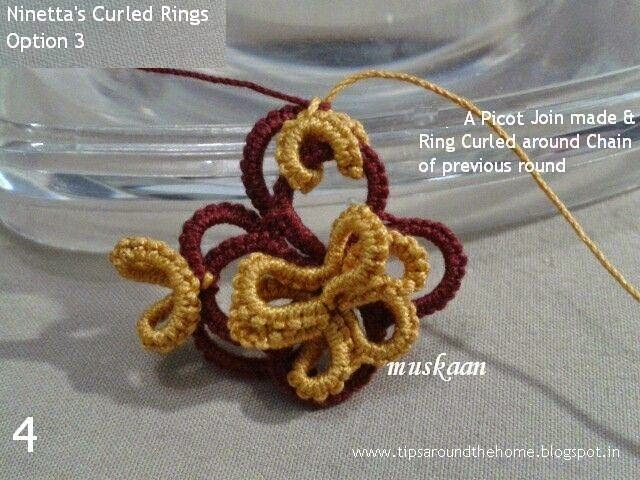 The length of picot that is anchored while curling, Or a space of bare thread left before anchoring, can also alter the look of the curled ring ! 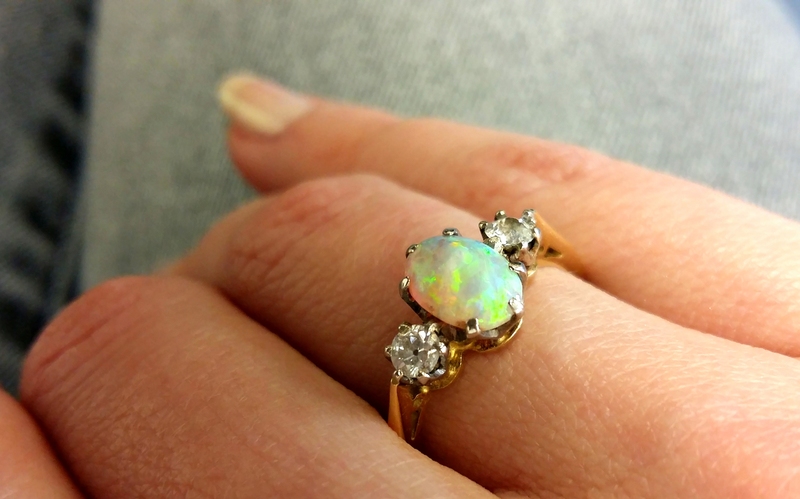 A vsp will curl the ring into a perfect half folding over itself. 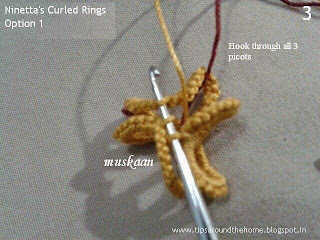 But a longer picot or bare thread space can ‘show’ more of the curled ring, like an cascading overlap. A picot that is offset, ie. 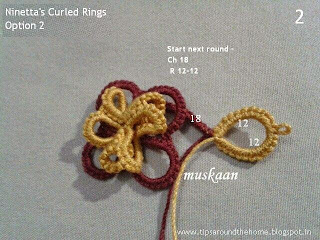 not in the centre of the ring, will give a slight unsymmetrical curling of ring. 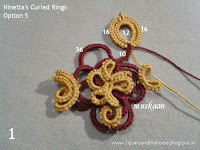 Curled rings, besides being decorative, add dimensionality to any ordinary flat tatting. They add elegance & interest & a certain character. They can transform any old/common pattern with a modern flair . 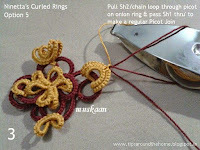 A "simple clover pattern" edging here, is transformed with curled Onion rings ! 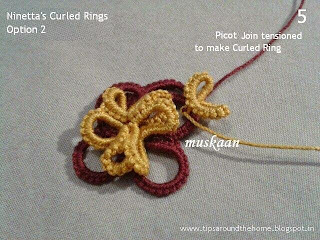 Curled rings can be substituted for a picot when trying to join to a previous element, row, or round ! Such as her segnalibro-aprile (Bookmark for April) here, where she uses them on split rings in the tail. 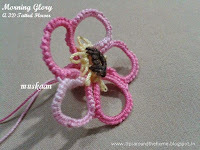 And of course, these can be used for all-out 3D tatting, as in the pendant I shared here , or the calyx of my Morning Glory flower! But beyond that, I believe I found a couple of other practical uses, especially, if like me, you don’t have the necessary jewelry-making supplies on hand. As in my pendant above, where I used a triple onion ring as a pendant hook, through which the chain can be inserted. 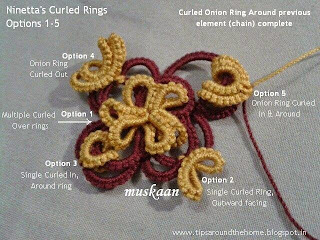 Not only is the curled onion ring sturdy, but it also continues from the pattern itself. 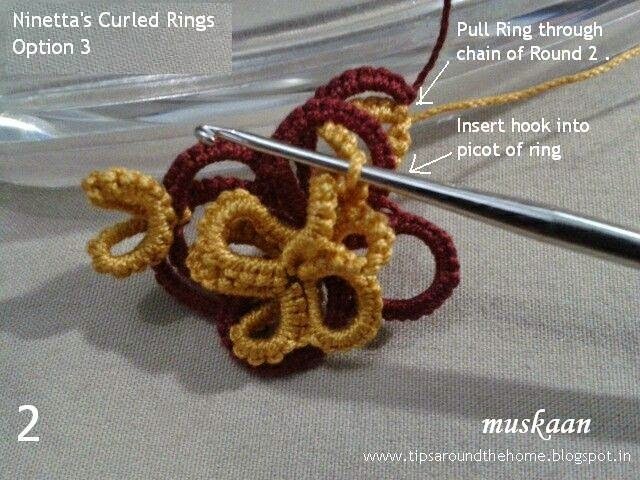 Similarly, for a bracelet, I made a curled ring at one end & a normal/Josephine ring at the other. The curled ring can be inserted through the normal ring & bracelet can be 'locked' in place; to ‘undo’, simply tug on the curled ring. It acts like a bracelet toggle ! Can we denote them as CR or C-R ? eg. for a normal ring, CR would’ve sufficed. But if it was a split ring, then CSR or C-SR ? Or in case of a single shuttle split ring : C-SSSR ? 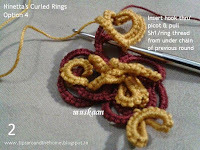 Or should we simply say 'Curl Ring' after the stitch count for ring is given ? 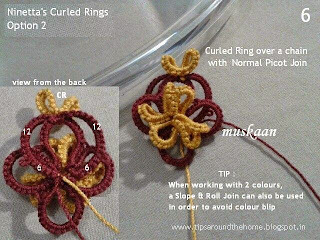 A freeform rings-only 3D flower that can be customized easily. As I mentioned in my last post, this is an “Extension” of the original Dillmont Motif which Ninetta modernized & diagrammed. All I did was ‘extend’ the pattern in all dimensions : layer upon layer in the center ; lower layered ring extending beyond the one above ; extended petals under & over the layered rings ; and so on. 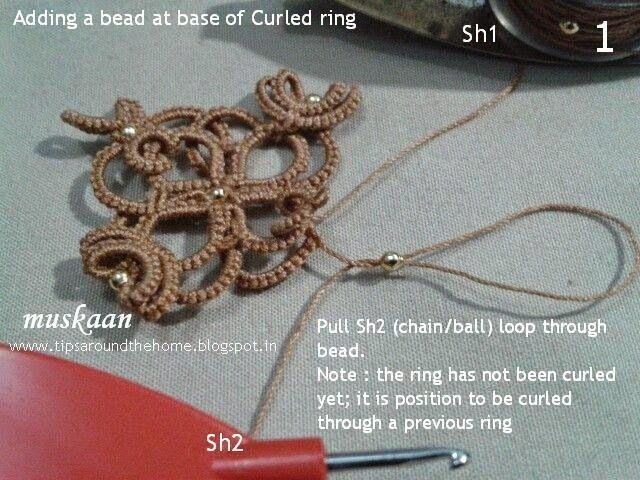 I managed to write up the pattern in pdf & upload it along with the post (scroll down), Yay ! 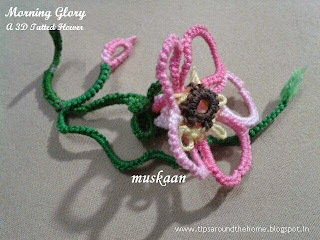 Hence this post is more an album of photographs of the Morning Glory Flower from different angles, at various stages. 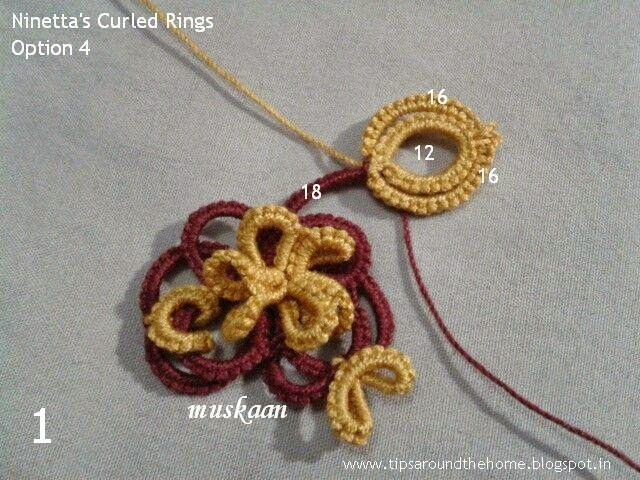 These center rings, however, are a bit fiddly to handle . would’ve been impossible for me. And this time, I used Both the steps ! This flower measures just over 1"x 1"
Although the broad arch of each petal has 16ds, I might've made a couple with only 15ds. 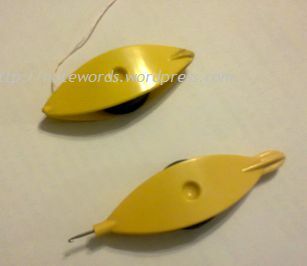 thread ends were encapsulated within the stem. However, one long tail of pink thread was left uncut. 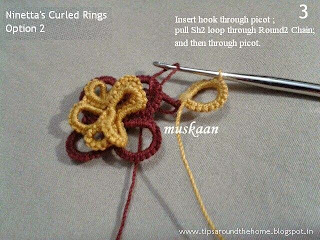 This was used to make the Folded ring bud. 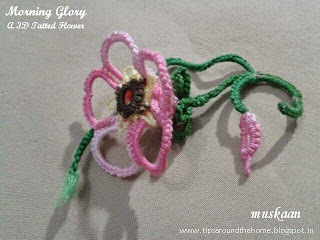 And again the pink thread was encapsulated within the stem. For the tendril, an auxiliary thread was added. The ends were cut & frayed. 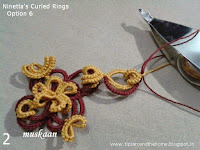 The stitches in this long chain were tensioned just enough to get a kind of rolling twist. If sts are snugged more tightly, we get a curlicue, as in the main stem. This entire doodle does not require any blocking. 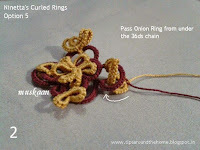 The large rings, long chains & encapsulation hold their 3D shape very well. It is extremely difficult to get a good perspective photograph of 3D freeform pieces. What I see with my eyes - the angle, the depth, etc. is not always captured with any fidelity ! UPDATE : I have changed the pattern link from Dropbox to Google docs for greater reach. The earlier Dropbox link has been removed, altho' it will still work, since the file hasn't been removed . Would be nice, though, if you could drop me a line/comment showing me your work, if you do make it. & to great masters like Thérèse Dillmont.